Gambel's Quail are stout birds which spend most of their time on the ground since they are rather poor flyers. They have mostly grey plumage with some brown and white markings. Males have a black throat. The most distinguishing feature is the curved feather than protrudes from their forehead. They can often be seen following each other in a row as they scurry through the underbrush. 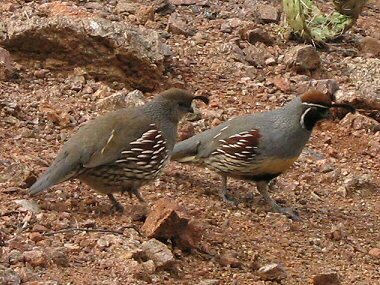 Gambel's Quail live in desert scrub and riparian areas, usually where water may be found nearby. They are well adapted to the desert and change their behavior during the summer months so that they are most active during the morning and evening hours when it is cooler. They will usually spend the hotter parts of the day resting in the shade of bushes or low trees. The dingle protruding from the forehead of the Gambel's Quail is called a 'top-knot'. Quail must obtain water daily either by drinking or from their food. They eat a variety of insects as well as the fruits of cacti and seeds. They are social birds and in the fall and winter they often live in groups of 20 or more individuals. During the nesting period they pair off and the female usually produces 10-12 eggs which take just under a month to hatch. The nest consists of a shallow depression lined with grass. Chicks all hatch the same day and will follow their parents around closely until they are old enough to take care of themselves.